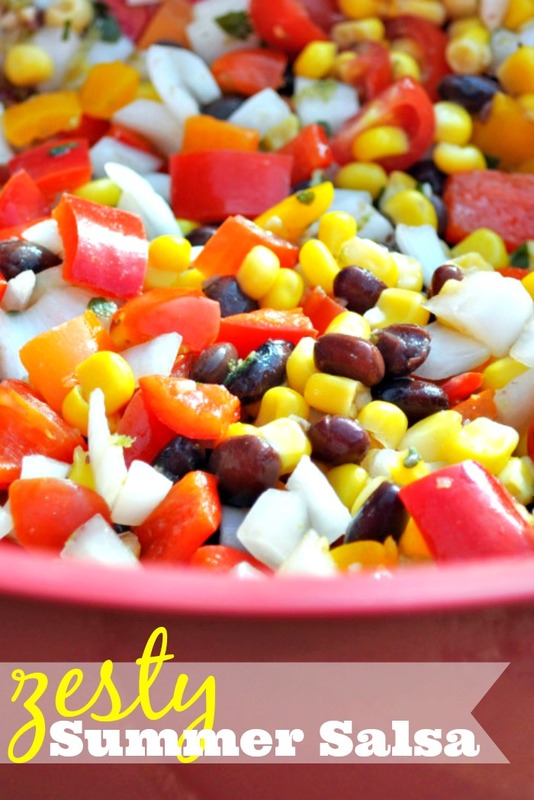 Here is one of my favorite recipes to make for a hot day – Zesty Summer Salsa! We had a fun party to attend on Saturday, so I decided to try making a “corn” salsa for the first time. I looked at a couple examples to see what ingredients people put in there as I am used to only tomatoes, peppers and onions, and then I just winged it Saturday morning. I have the recipe all nicely written out for you, but my process was more like throw things in the bowl and see what looks proportional. This is probably why the husband thinks my cooking process is hard to replicate, but I get it from my mother; nothing is exactly the same twice. In a large bowl, combine the chopped onions, lime zest & juice, and salt. Stir well and let sit while you chop the rest of the ingredients. You want to give the onion time to soak in the lime. Chop the rest of your ingredients and add to the bowl. Mix well. NOTES: For the peppers, I ended up using a bag of the sweet peppers because of cost. If you decide to use a full bell pepper, it would probably be about ¼ of the pepper for each color. As for the tomatoes, I chose to use the small tomatoes to chop because I wanted less juice in the salsa. After I chopped the tomatoes, I even dabbed them a bit with a paper towel to absorb as much access liquid as I could before adding them to the bowl. I am sure roma tomatoes would work as well though. You can serve immediately or refrigerate until ready to serve. I used my chiller bowl to keep the salsa cold even when outside. I love my chiller bowls; they make life so much easier! You can find them on Amazon (affiliate link): Fit & Fresh Chiller Serving Bowl . What kind of salsa do you enjoy? Traditional tomato or lots of variety? So excited!!! A second Liebster award! 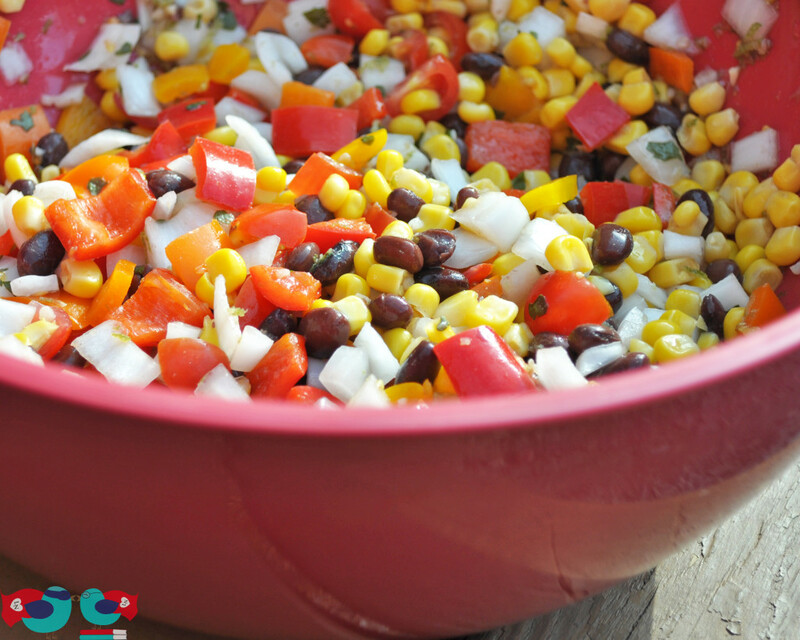 This is a fantastic idea to make for our next BBQ— this salsa just screams summer! Thanks, Heidy! I’m planning on making a batch in a couple weeks and I can’t wait!! this looks like the perfect salsa to celebrate cinco de mayo next week!! I’d have to add some jalapenos though! lol So colorful!! I want to grab a chip and dip right in there! I cook the same way – just eyeball it! This salsa looks great. I’m making tacos for dinner tonight and I bet this would be perfect on them. Love these pictures! It was so delicious!